Today, Liz Fenwick stops by to take part in my Inspired By feature. The Path to the Sea is published in June and you can pre-order it on Amazon. Award winning author of The Cornish House, A Cornish Affair, A Cornish Stranger Sky, Under A Cornish, The Returning Tide, One Cornish Summer and a novella – A Cornish Christmas Carol. 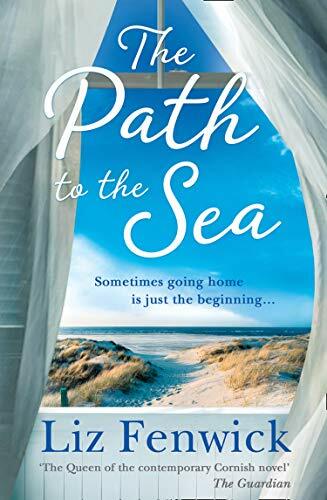 The Path To The Sea will be out on 25 July 2019. After ten international moves, she’s a bit of a global nomad. It’s no wonder her heart remains in Cornwall. Can you tell us about someone who inspired your writing in some way? What it means to you now and if you could say anything to them what would it be? In high school I had tutor for English because of to my dyslexia I struggled with spelling and grammar. She discovered…then actively encouraged me in my dream of being a writer. Put simply she believed I could, and she would read my stories and help me with the ‘technicalities’. Her belief that I could was so strong. So when I was published in 2012 many long years after she had helped me I named her in the acknowledgements. I’d lost touch with her years before but fate was kind and when cleaning out a box of old papers I found my old address book. With a bit of googling I discovered a family with the same name lived at the address. I wrote a thank you note and sent a copy of the book. Now we correspond regularly and her joy in my success means the world. So with each book I say thank for the belief that I could do it, I could follow my dreams and succeed. What words of advice would you offer anyone starting their writing career? The most required skill is persistence and to understand that the journey is valuable. That time before breakthrough is when to learn about the industry and to hone your craft. It is a dream fulfilled. I have always loved stories and to be be able to write stories that people read and love is dream come true. Finally, do you have a favourite bookish quote. Boskenna, the beautiful, imposing house standing on the Cornish cliffs, means something different to each of the Trewin women. For Joan, as a glamorous young wife in the 1960s, it was a paradise where she and her husband could entertain and escape a world where no one was quite what they seemed – a world that would ultimately cost their marriage and end in tragedy. Diana, her daughter, still dreams of her childhood there – the endless blue skies and wide lawns, book-filled rooms and parties, the sound of the sea at the end of the coastal path – even the family she adored was shattered there. And for the youngest, broken-hearted Lottie, heading home in the August traffic, returning to Boskenna is a welcome escape from a life gone wrong in London, but will mean facing a past she’d hoped to forget. As the three women gather in Boskenna for a final time, the secrets hidden within the beautiful old house will be revealed in a summer that will leave them changed for ever.